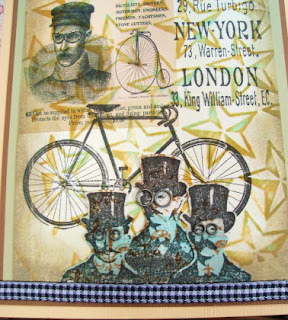 Vada's Blog Stamp Inks and Paper : GC-109 Chestnut Theme is “On the Road”. 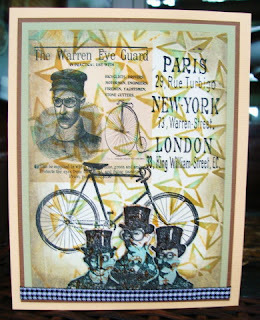 Thought I would try my hand at this theme, here’s my card using Bicycles, and protective eye ware. Stamp credits are Stampers Anonymous and Recollections, graphic is from “The Graphic Fairy”. How great! And it's good to see another post from you. Wonderful- very creative -I love the colors you used! This is amazing Vada!! I love what you have done! Very Steampunky. (Is that a word?) I like it. This is an outstanding interpretation of the challenge theme. Absolutely brilliant card! Love the colours and the mixture of images. Glad you joined the challenge at Gingersnap Creations. That's a fabulous collage, love the images. What a fun card! Love all your layered stamping.